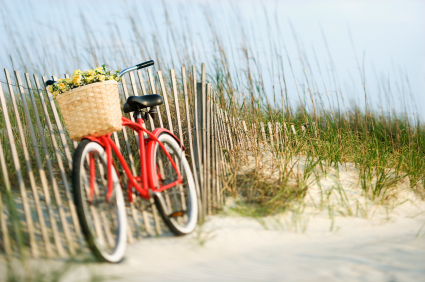 Each year it seems the popularity of bicycling grows here on the Crystal Coast. One only has to watch the steady stream of vacationers with bike racks filled with bicycles cross the Cameron Langston Bridge from Cedar Point to Emerald Isle. No doubt, the bike path that parallels Highway 58 in Emerald Isle is a major reason for so many bicycle racks jammed with bikes. If you’re one the many families traveling to the Crystal Coast from distant locales like Ohio or maybe Pennsylvania, you might have second thoughts strapping several bikes to your trunk or lip of your minivan. For those who would rather make life less complicated, you might be interested to know there is a local Emerald Isle bicycle shop owned by Bette, Wayne and Ron Ryan. Wayne and Ron are a father and son team own and operate Highway 58 Bicycles. Wayne and Ron at rent cruisers, Ventura Jamis brand Road bikes, hybrids, children’s bikes (some with training wheels), beach carts and even big-wheeled jogging strollers. Each adult bike comes with lock, basket or rear brake. Because safety is so important to the team at Highway 58 Bicycles, every rental (adults and children’s bikes) comes with a free helmet. If you happen to experience a flat tire (we did) or need to have your brakes adjusted (needed this too), the team at Highway 58 Bicycles offers expert service, superior customer service and reasonable repair rates. We found the shop owners to be most helpful and knowledgeable too. 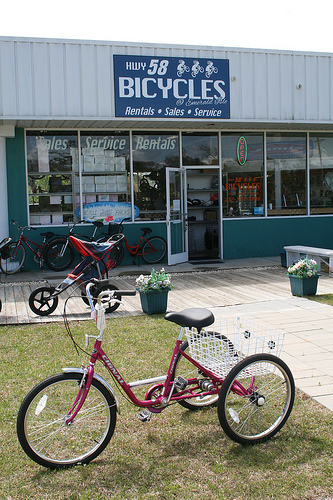 The staff here at the Crystal Coast Blog heartily recommends the sales and services of Highway 58 Bicycles. As always, the staff at the Crystal Coast Blog received no compensation for this review. We are simply sharing our experience so you too can benefit from these fine folks. Want to Get Healthy? Walk the Beaches of the Crystal Coast! Thanks for the site it looks good and your comments are great. We at Hwy58 Bicycles thank you. Hi Ron – We so appreciate your comments. You guys offer excellent customer service and reasonably priced services too.